(Nanowerk News) For the first time, a German-American research team has determined the three-dimensional shape of free-flying silver nanoparticles, using DESY's X-ray laser FLASH. The tiny particles, hundreds of times smaller than the width of a human hair, were found to exhibit an unexpected variety of shapes, as the physicists from the Technical University (TU) Berlin, the University of Rostock, the SLAC National Accelerator Laboratory in the United States and from DESY report in the scientific journal Nature Communications ("The 3D-architecture of individual free ?silver nanoparticles captured by X-ray scattering"). Besides this surprise, the results open up new scientific routes, such as direct observation of rapid changes in nanoparticles. Nanoparticles are becoming increasingly pervasive in our everyday lives. These tiny particles, invisible to the naked eye, have widespread applications, ranging from sunscreen and paints to colour filters and electronic components. They are even promising for medical purposes including cancer treatment. "The functionality of nanoparticles is linked to their geometric form, which is often very difficult to determine experimentally," explains Dr. Ingo Barke from the University of Rostock. "This is particularly challenging when they are present as free particles, that is, in the absence of contact with a surface or a liquid." The nanoparticle shape can be revealed from the characteristic way how it scatters X-ray light. Therefore, X-ray sources like DESY's FLASH enable a sort of super microscope into the nano-world. So far, the spatial structure of nanoparticles has been reconstructed from multiple two-dimensional images, which were taken from different angles. This procedure is uncritical for particles on solid substrates, as the images can be taken from many different angles to uniquely reconstruct their three-dimensional shape. "Bringing nanoparticles into contact with a surface or a liquid can significantly alter the particles, such that you can no longer see their actual form," says Dr. Daniela Rupp from the TU Berlin. A free particle, however, can only be measured one time in flight before it either escapes or is destroyed by the intense X-ray light. Therefore, the scientists looked for a way to record the entire structural information of a nanoparticle with a single X-ray laser pulse. To achieve this goal, the scientists led by Prof. Thomas Möller from the TU Berlin and Prof. Karl-Heinz Meiwes-Broer and Prof. Thomas Fennel from the University of Rostock employed a trick. 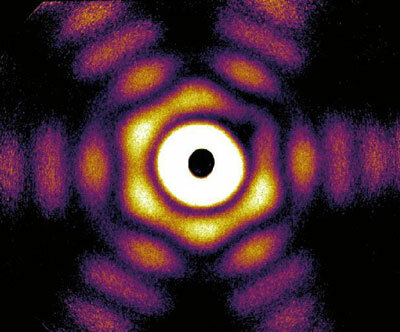 Instead of taking usual small-angle scattering images, the physicists recorded the scattered X-rays in a wide angular range. "This approach virtually captures the structure from many different angles simultaneously from a single laser shot," explains Fennel. The researchers tested this method on free silver nanoparticles with diameters of 50 to 250 nanometres (0.00005 to 0.00025 millimetres). The experiment did not only verify the feasibility of the tricky method, but also uncovered the surprising result that large nanoparticles exhibit a much greater variety of shapes than expected. The shape of free nanoparticles is a result of different physical principles, particularly the particles' effort to minimize their energy. Consequently, large particles composed of thousands or millions of atoms often yield predictable shapes, because the atoms can only be arranged in a particular way to obtain an energetically favourable state. In their experiment, however, the researchers observed numerous highly symmetrical three-dimensional shapes, including several types known as Platonic and Archimedean bodies. Examples include the truncated octahedron (a body consisting of eight regular hexagons and six squares) and the icosahedron (a body made up of twenty equilateral triangles). The latter is actually only favourable for extremely small particles consisting of few atoms, and its occurrence with free particles of this size was previously unknown. "The results show that metallic nanoparticles retain a type of memory of their structure, from the early stages of growth to a yet unexplored size range," emphasizes Barke. Due to the large variety of shapes, it was especially important to use a fast computational method so that the researchers were capable of mapping the shape of each individual particle. The scientists used a two-step process: the rough shape was determined first and then refined using more complex simulations on a super computer. This approach turned out to be so efficient that it could not only determine various shapes reliably, but could also differentiate between varying orientations of the same shape. This new method for determining the three-dimensional shape and orientation of nanoparticles with a single X-ray laser shot opens up a wide spectrum of new research directions. In future projects, particles could be directly "filmed" in three dimensions during growth or during phase changes. "The ability to directly film the reaction of a nanoparticle to an intense flash of X-ray light has been a dream for many physicists - this dream could now come true, even in 3D!," emphasises Rupp.